The global transition to renewable sources of energy is in full swing. The social and economic opportunities presented by this transformation are spurring the growth of renewable energy generation in many countries. Among many other countries South Africa is in the midst of an energy transition, with important social and economic implications, depending on the pathways that are chosen. Against this background South Africa has launched a widely acknowledged country‐wide Just Transition Dialogue series. The whole debate boils down to a single question: How can renewables improve the lives of the people in South Africa? 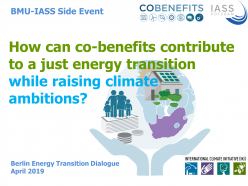 Four new studies, published by IASS Potsdam and CSIR Energy Centre, contribute the much‐needed data and figures to this question. They provide important guidance on further shaping South Africa’s energy pathways to maximise the social and economic co‐benefits of the new energy world of renewables while facilitating a just transition.